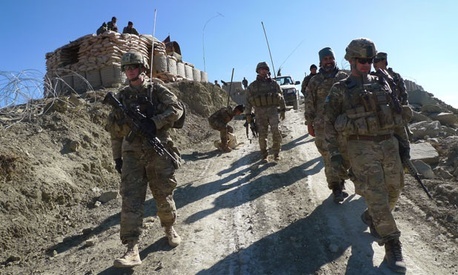 During the presidential-election campaign the positions of President Obama and presumptive GOP nominee Mitt Romney have converged on the issue of withdrawing most U.S. forces from Afghanistan by the end of 2014. Neither the Obama administration nor the Romney campaign has made clear, however, how fast the remaining force of 68,000 U.S. troops should be pulled out between now and that deadline. With an important milestone approaching next month – when the last of the 30,000 “surge” troops will exit the country – U.S. military commanders are indicating their desire to keep as many of the remaining troops in Afghanistan for as long as possible. U.S. commanders are angling for maximum force levels because, in their view, the situation in Afghanistan is already reaching its maximum in risk tolerances. “In terms of the mission, the main risk we face is not finishing the work of clearing the Haqqani network from areas in the east that are very close to Kabul,” said Lt. Gen. Dan Allyn, until recently the top U.S. military commander in Afghanistan’s Regional Command East, speaking on Thursday at the Institute for the Study of War in Washington. If the United States keeps the remaining 68,000 troops in-country through next year’s fighting season, it can finish that job, he said. Otherwise U.S. commanders will have to hand the burden to Afghan Security Forces that are still struggling to stand on their own. “That’s not an insignificant risk,” he said. If history is any judge, however, the generals may not get their wish for a pause in troop withdrawals. The White House is reportedly considering a plan backed by National Security Adviser Thomas Donilon to pull 10,000 more troops out by the end of December, for instance, and then 10,000 to 20,000 more by next June.